: Pale yellow liquid. with Characteristic camphorous herbaceous odor. : Steam distillation of the dried herb. 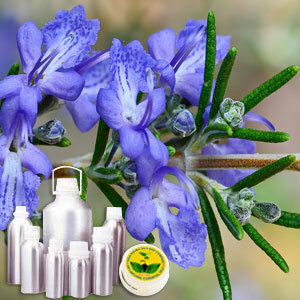 A top note with a strong aroma, Rosemary has a fresh, strong, woody and herbal scent. This Wildcrafted Oil blends well particularly with Citronella Cedarwood, Geranium, Lavender, Lemongrass and Peppermint. This Wildcrafted Oil is known for antiseptic action, especially for intestinal infections and diarrhea, easing colitis, dyspepsia, flatulence, hepatic disorders and jaundice. It also helps in headaches, migraines, neuralgia, mental fatigue and nervous exhaustion. Due to its astringent action, it is effective for countering sagging skin and also benefits in scalp disorders and encourages hair growth.